As a military combat paramedic, ground and flight paramedic, Joe Stephens has dealt with brain injuries. He knows brain injuries do not discriminate, and they may happen anytime, anywhere, to anyone. In August 2013, Joe was stung on the back of his head by a red wasp, shortly after his wife dropped him off at his mother’s home. He experienced an allergic reaction, which led to an Anoxic Brain Injury. Joe, a flight paramedic for the De Queen, Ark., Air Evac Lifeteam base, quit breathing about 15 minutes after he was stung. Thankfully, he called his wife (a ground ambulance paramedic), who called for an ambulance and Air Evac. “My teenage son gave me mouth-to-mouth in the back seat of the car as my wife drove to meet the ambulance,” Joe said. 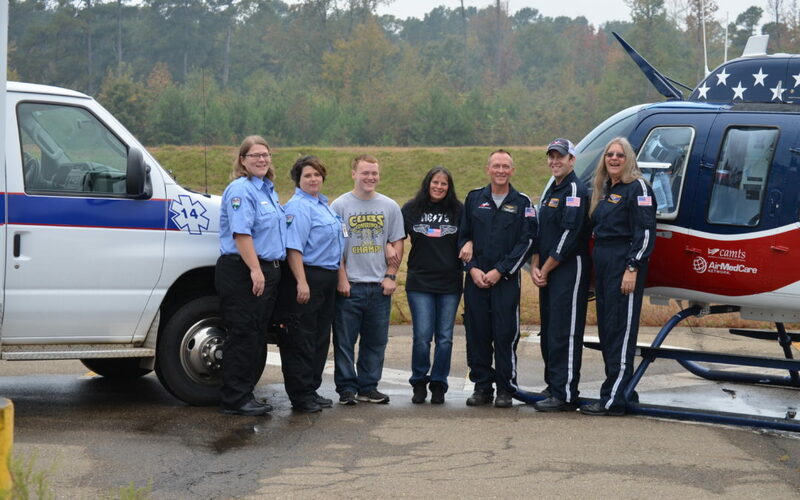 The Southwest EMS crew secured an airway, and the Air Evac Lifeteam crew of pilot Katrina Bolls, flight paramedic Justin Kinkade and flight nurse Jackie Wright flew their co-worker and friend to Wadley Regional Medical Center in Texarkana, Texas. Joe spent more than 10 days in the hospital before being released to a rehabilitation facility in De Queen. Two weeks later he went to Timber Ridge NeuroRestorative in Benton, Ark., and remained there for two months. It was an uphill battle, but Joe never doubted he would return to work at Air Evac. Nearly six months after the wasp sting, Joe returned to Air Evac. Pilot Michael Hambrecht was happy to have his friend back in the air.